A sanding machine that is bench mounted. Used for sanding timber. Similar machines for finishing metal are known as linishers. A combination bench top machine that has a belt sander and a vertical disk sander. The photo here is just showing the basic machine. When used there are ALWAYS a vertical fence like guide to the belt with more often than not and end stop. These to hold the material steady while sanding. Likewise the disk (that must have sandpaper attached) must have a flat horizontal support or guard for the material to rest on. This guard can be angled similar to the guards on bench grinders. These are workshop machines that come in a variety of designs, mainly either disc or belt types with varying sizes in each, and different orientations. It depends on the type of work. 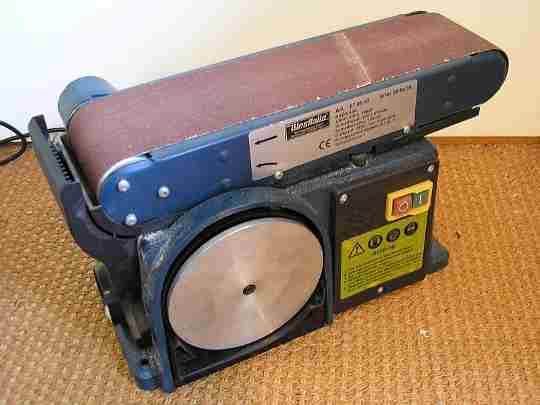 The sander above is a combination machine with both a vertical disc sander and a horizontal belt sander. The main thing about all bench machine is there ease of use, compared to hand held power tools. With a conventional power tool sander one hand and sometimes both has to be used to hold the tool so that the work has to be held in some other way. The bench machine lets you keep both hands free for holding the work and this results in very fast sanding of many parts. These sanders are useful to furniture and toy makers in particular. Apart from speed of use, another aspect of these bench tools is that of ACCURACY. Most of these sanders can have stops set up to 90 and 45deg. and the tables can tilt .